Native advertising is advertising that looks to mobile app users as natural as the original content. Native RTB blocks are advertising blocks with Yandex.Direct ads, in which app owners can configure how each element is displayed. Native RTB blocks can only be displayed in apps on mobile devices in strict compliance with specific rules and restrictions. 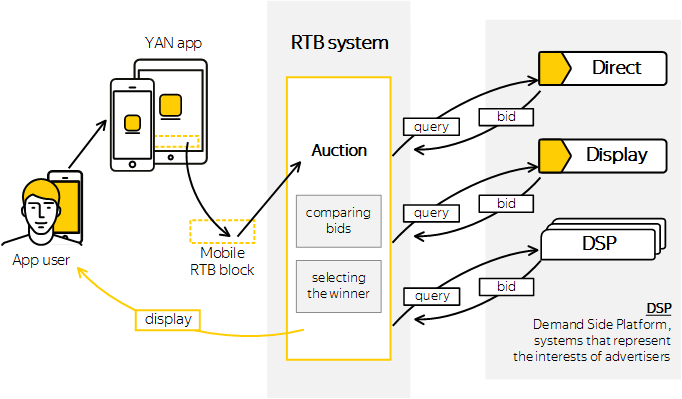 Real-Time Bidding (RTB) technology is used to display native ad blocks in Yandex Advertising network. Real-Time Bidding is a technology used to sell and buy ad impressions based on real-time auctions. RTB lets you maximize revenue from ad impressions, as the most profitable ad is automatically chosen out of all advertisers' ads. How cost per impression is determined for native advertising. How to create a native RTB block with our visual ad code designer. Available settings for native RTB blocks.